Thanks for the good wishes for my hands. I have finally wised up and made an appointment for a therapeutic massage. I can't bear the thought of knitting socks, which is the only small needle project I can imagine right now. 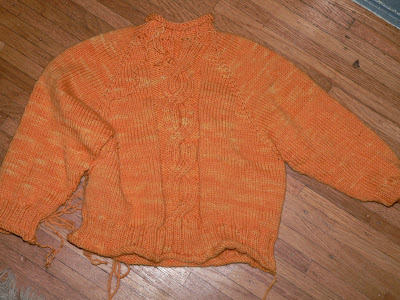 So I'm simply choosing to reknit the ripped portions of the orange sweater. When I can find my fourth needle, that is. (Imagine it Just Like the last picture except without the fifth neck finishing and with half of the sleeve done. It's going backwards in time!) I am musing on the idea of a steeked zip closure. 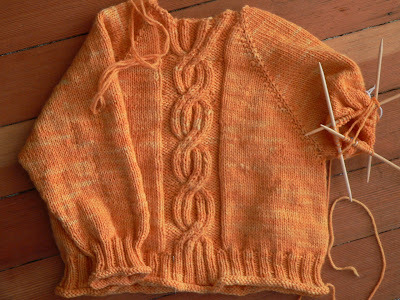 I'm going to master this sweater, I tell you, but perhaps not by the end of the month. So instead of regaling you with knitting tales, I propose a little snapshot. I'm also thinking about how my household disaster stories cheer other people up, so I'll do my humanitarian bit. It's pouring rain outside -- the kind that goes "tacka tacka tacka" on the windowpanes, leading to thoughts of dry rot and back door leaks and yep boy did I forget to bring my handwash laundry in from the back deck last night -- so I'm thinking of the bike riding I'm not doing today. But a few days ago, it was beautiful, if cloudy, and I did take a bike ride. After years of hard riding on a used bike, a replacement came home with me because I couldn't face another repair bill on the first one. So the kids and I decided to do our grocery shopping by bike, something everyone enjoys and we feel good about. I was excited about my new bike, especially when I discovered the little bell on the handlebar! We made it to the shopping center relatively happily and with few heart-stopping child-darting-into-traffic moments. A good leg of the trip. For some reason, a dispute broke out about who was going to fetch the shopping cart, and that sort of simmered off and on for the rest of the trip. Amazing the opportunities for argument in a food emporium. Shopping done, including a case of fizzy water and a gallon of milk, plus many many canned goods -- still stocking that earthquake kit, a little at a time -- we exited the store and tried to figure out how to pack things in. Thing 1 had the handlebar basket; Thing 3 had borrowed Thing 2's bike (she was sick at home) and had a small basket; I had the trailer and two panniers. Heavy canned things in the panniers, case of water and milk and three grocery bags in the trailer behind and beside Thing 4. Thing 1 had some lighter items in her basket, Thing 3 had three hotly contested boxes of organic macaroni and cheese in his basket. First, the bigger Things had to argue about whether or not the mac and cheese was going to bounce out. "You know he was jumping curbs on the way here!" "Well, I'm not going to now!!" Bicker, bicker. Then, as we mounted up, I kicked one pannier off of the rack. Its attachment is slightly broken, and I often forget any kind of bungee cord to help keep it on. Finally we left the shopping center and began the laborious trek home. Really, I live on a nearly flat island, but 100 pounds of groceries and child makes its own hills. Sure enough, the macaroni and cheese fell out of the basket a couple of times, engendering simultaneous cries of "Wait for meeee!" and "I told you so." After the third drop, we suggested that he lose one or two of them into someone else's bags. The basket on Thing 1's bike was canted at a dangerously low angle -- it's just not fitted for her bike -- so I inherited it. Along the busiest street we could be riding on, I tried to shift to first gear (remember, pounds and pounds of groceries/old mama) and my chain popped off of the gear wheel. I sent the other two on and sat down to fix the chain. The back of the bike was so pannier-heavy that I couldn't lift it to spin the wheel to help guide the chain on. Also -- no kick stand, so I have to hold up the bike. That was really fun! Finally I got it back on and headed off to chase the others. I saw them ahead, and shouted at them to wait until I got there. They waited until I was closer, then pulled away again. So I chased them for a few quiet blocks, piteously bleating, "Are you going to wait for meeeeee?" Meanwhile, Thing 4 has been saying, "Baby get out" over and over and over and over. She fell silent just as I went over a bump, kicked the pannier off again, and heard a "bang!" The trailer tire had popped. I tried to wrestle the pannier back on the rack and noticed at the same time that Thing 4 had taken a box of wrapped quarter pounds of butter, opened it, unwrapped a quarter, and was cheerily munching it. Some tears were shed by me. I may have said, "I just can't take this." Thing 1 bravely wrestled the butter away from the baby, rode off to catch her brother and keep him from crossing the Street of Death, the pannier went back on the bike, the trailer just has to deal with its flat tire, and we got home. Whereupon my spouse met me to say he'd made a doctor's appointment for himself and his possible asthma and didn't I want to hear about it? No, sorry to say, at that moment I didn't. Later on I did, after trying to get the kids to at least help put the frozen stuff away, wouldya, and I hope he starts feeling better when they figure out what's wrong with him. So take heart if you haven't had a morning like this lately, or even if you have. One of my favorite books of all time is Cheaper by the Dozen, the based-on-true-life story of the Gilbreth family, who had 12 children and one parent who was a psychologist and the winner of a prestigious prize for engineering, and one who was a famous motion study scientist and engineer in his own right. It's just a delightful read, and now I'm off to find out if our library has this biography of Lillian Moller Gilbreth. While the book is delightful, and no doubt had some influence on my decision to have lots of children and be intimately involved in their education, I've been musing a lot about efficiency lately. Well, to be honest, my complete lack of efficiency. Sure, I carry 10 dishes at a time from the dishwasher to our cabinet (cunningly located in another room -- thanks, Victorians! ), but overall I'm not a motion study expert. Take this project for an example. is what happens when you pick up the bar between stitches using double-pointed needles, create a whole new stitch line, and then drop that stitch when you think. . . "heeeyyyyy, this doesn't look right!" Taaa daaaa -- a lovely ladder. Oh well, had to redo anyhow. . .
And you know, while it would be nice not to make bonehead errors like repeatedly underestimating the non-pinheadness of my child, or not making dopey stitch errors, it's not horrible to be inefficient at knitting. I'd like more finished objects and less smacking of forehead, but that's the way it goes. Learning to be okay with my imperfections may be the work I'm presented right now. Or maybe I'm being all philosophical because I've got some nasty repetitive stress injury that's exacerbated by knitting and my right hand goes numb and my left hand hurts so much that knitting fast isn't an option. Knitting at all is truly a luxury right now. I think the injury is stress from carrying an increasingly-heavy toddler, plus knitting, plus time at the keyboard, but rest and ice and ibuprofen are the paths to acceptance that I'm trying. 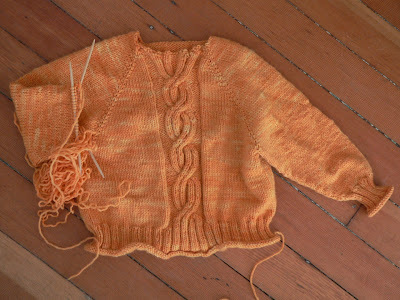 And while I like the idea of redoing sweaters as my children grow, making repeated errors on them renders me incapable of wanting to do anything on them ever again. Ask me about the socks that want darning. . . In happy news, though, I just got some much-appreciated professional recognition and am now going to learn how to develop curriculum as well as teach it, and my spouse has gotten some very nice (and more lucrative) professional recognition, and our bedroom is sparkly clean. Oh, and the kids and I and my brother in law and his kids and two neighbors just spent our first afternoon at the beach. Beautiful weather, happy wet children -- even though the water was so cold that my feet went numb and Thing 4 insisted on standing on my shoes instead of in the water or wet sand -- and a lovely interlude. Nothing efficient, nothing better. It's 9 am here, and so far this morning I have (all by myself) unloaded the dishwasher, nursed a baby, made coffee for the spouseman to take to work, vacuumed the house to fight the rain-encouraged ant infestation (kids cleared some of the floor), made breakfast for 5 people, cleared up after breakfast for 5 people, made my bed, dressed, nursed the baby, dressed the baby (clothing chosen by sister), wiped up one spill, said thank you to big sister for wiping up another spill, read the comics, framed two pictures done by Thing 2, found spots to display framed pictures (not easy in a house with no horizontal display surfaces), wiped down the bathroom floor, took a lot of paper goods to the recycle bin, nursed the baby, helped Thing 2 write a shopping list for clothes, suprevised animal-related kid chores, took the baby's tea-covered sock off, caught a parakeet-hunting scratching kitten, helped get the parakeet back in its cage, cleaned and bandaged two people's cat scratches, helped Thing 1 get the mop set up to mop away the ant's scent trail, moved the barricade of a crib that Thing 3 put across his door, cleaned up half of the under-crib area, agreed with Thing 1 that he was "creative but obnoxious," picked up the spit-out pieces of apple that Thing 4 put on the freshly-vacuumed rug . . .
That first sleeve is done but in need of lengthening -- I think he grew while I was knitting it. That string tied to the top is a cheater. I knit to the knot and it's supposed to be the right length. 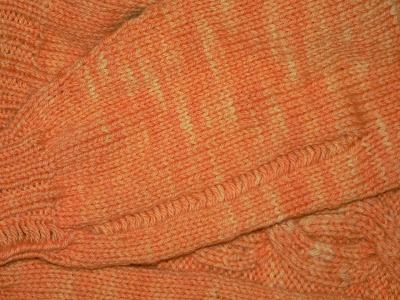 The second sleeve is using non-stretchy yarn. If the second sleeve allows, after the collar I'm going to lengthen the body too. 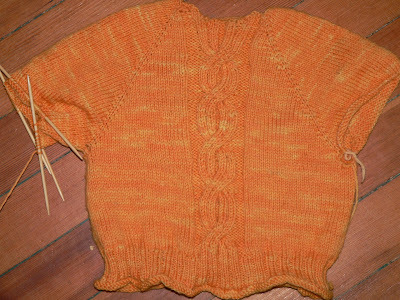 This sweater was supposed to be done early so I could start on the Blinding Black Saddle Shoulder Sweater, but oh well. 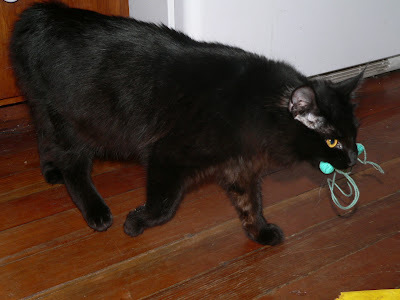 It's not like finishing it is going to be easy, thanks to Puck the kitten. He is utterly obsessed with my Chibi, and I don't think it's the loop I tied to it. I am forever chasing my finishing needles. 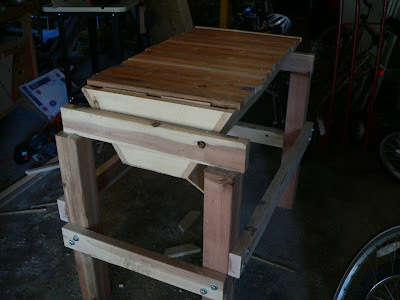 It's a top-bar beehive fashioned after this one, with some modifications. 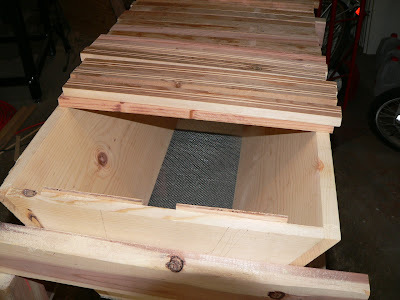 Even with freshly-bought materials, it's about a third of the cost of a traditional, or Langstroth hive, which is what I've been using so far. He's happy with it, and I'm sure the bees will be, too. In this kind, the bees suspend their comb from the bars -- see the little ridges? and there's no frame around it, plus no foundation on which they build the comb. The shape mimics the half-oval honeycomb is in the wild. It yields a little less honey, and a lot more wax than a traditional hive, but there may be some health benefits. For instance, the screen at the bottom is so the varroa mites (nasty, nasty parasites) fall off of the bees and can't get back on. In a traditional hive, they can either climb back or fall onto another bee. These mites might (heee) be responsible for whatever disaster is befalling my current hive. I'm going to go to the bee meeting tonight -- knitting time! -- and ask some questions so maybe I can rescue the crashing population. Anyhow, since I have friends who are interested in hosting colonies of bees for me in exchange for a portion of the harvest, a less-expensive hive option has to be tried. Thank goodness he's handy! I don't dare hope for knitting time until Miguel comes. But now that the kids are playing some complicated zoo-paper airplane game, maybe I can make two phone calls and look for that missing cell phone. No posts because it feels as though nothing happens here. Well, a lot happens. . . just nothing that lasts more than 12 hours. Cook, eat, clean up, laundry, school, repeat. 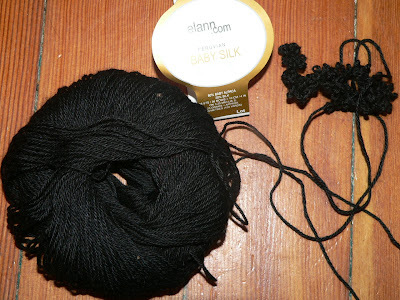 It's easy to get caught up in the rush of minutiae and, well, not knit at all. I had the February sweater done to the bottom, lacking only the sleeves. One day I sat on the front steps and watched my two youngest play while picking out the too-tight neck and redoing it. Next time I knit this pattern (and I will; it's my favorite for children), I always tell myself, I will do the sleeves immediately after finishing the raglan increases. Maybe this time is the one that will actually teach me that lesson. Not only is it no fun to turn an entire sweater while working on a sleeve in the round, but I hate knitting sleeves, and I let this little thing languish as sort of a Renaissance jerkin for too long. The motivator for picking it up and getting those dratted sleeves knit (and, I fear, ripping out the bottom and lengthening the sweater)? Swatching for the next one. Really, this stuff is going to make me go blind. Guess I am going to have to buy an Ott Light as I couldn't even see the rib pattern under household lights.